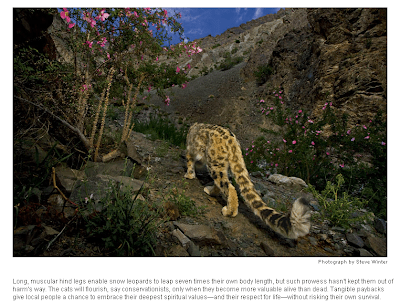 This is just one shot of a snow leopard captured by a camera trap in the Himalayas by photographer Steve Winter. There’s a gallery of his shots up at National Geographic. The length of the tail helps the big cats keep their balance on rocky precipices, and is also useful for wrapping around themselves to stay warm. I wish I had a tail like that this morning (an actual attached one not one formerly belonging to an animal). I could have used the extra warmth. 3 degrees and the fog didn’t lift until midday. I nearly put on a thermal this morning then convinced myself I wouldn’t need it. FAIL. I’ve been wearing thermals for the last two weeks, Mindy! Light thermals, not the ones that I’d take skiing, but there’s nothing like them for keeping the chill off the skin. Wow. Thanks for the link to the photos, Tigtog. The next Apple OS X update is to be called Snow Leopard (they’ve all been named after cats, Tiger, Panther, Leopard) and I read someone saying somewhere it would be nice if they gave some proceeds to snow leopard preservation. Hope they do. Re cold: I broke down and bought a cudlee. Love it! A cat with a built-in furry boa… fabulous! I was cheered to read about the efforts they are making to help the locals protect their stock in other ways in return for an undertaking that the locals won’t shoot a leopard just for taking an animal or two. re: cudlee – GINMF – that’s not like a Snuggie, is it? Apparently in the States this last winter there were Snuggie pub crawls. Because who doesn’t walk into a pub looking like a lost excursion group from Hogwarts? Yes, I thought the idea of paying for vaccines for the herd so fewer die making a couple taken by snow leopards less of a loss was a fascinating approach. Yes a cuddlee is a snuggie. They seem to go by various names. My friend in the states says they are also called a Slankit. I could never wear anything called “a Slankit” I don’t think. Its comfy for lounging in, but a serious hazard to try and walk in! At that price I would have bought one for myself and for both my parents, Amanda! The price you see on TV is ridiculous for a back-to-front dressing gown, but I can see how they would be comfy.